For centuries cartographers were fond of depicting monsters along the edges of their maps. Now, researchers have depicted a monstrous galaxy near the edge of the charted Universe with unprecedented detail using the Atacama Large Millimeter/submillimeter Array (ALMA) with the assistance of a 'natural telescope' known as a gravitational lens. The team modeled the lensing effects and corrected for them to reveal the distribution of huge stellar cradles in the monstrous galaxy. As a bonus, the same model indicates, for the first time, the existence of a supermassive black hole at the center of the foreground galaxy. During its high resolution test observation campaign in October 2014, ALMA imaged the monstrous galaxy SDP.81, located 11.7 billion light-years away from the Earth in the constellation Hydra. 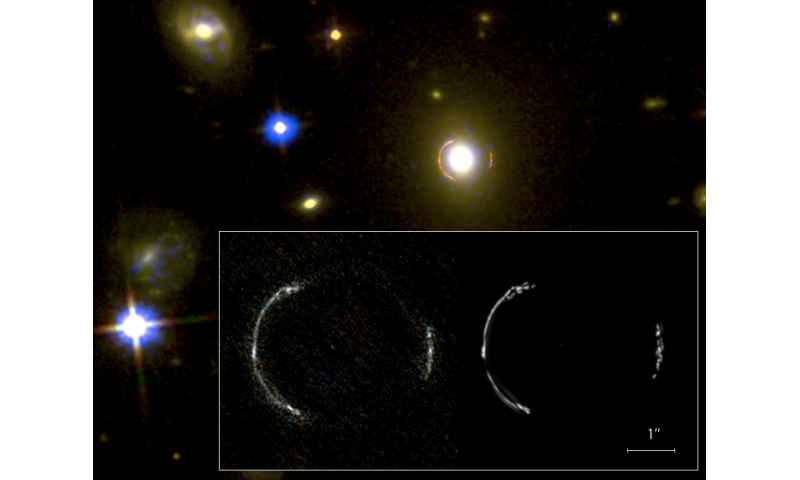 A gravitational lens created by a massive foreground galaxy 3.4 billion light-years from us acts as a natural telescope, magnifying the image of SDP.81. The image becomes brighter but smears into a ring shape, as can be seen in Figure 1. This ultra-sharp image of the ring astounded astronomers around the globe, but it has been difficult to understand the details of its complicated structure. Yoichi Tamura and Masamune Oguri, assistant professors at the University of Tokyo, together with researchers at the National Astronomical Observatory of Japan (NAOJ), constructed the best model to date for the gravitational lens. Using this model, they corrected for lensing effects and revealed that SDP.81 is a monstrous galaxy forming stars at hundreds to thousands of times the rate we see in the Milky Way. This is an important step to understand the evolutionary process of starburst galaxies and supermassive black holes in galaxies. Einstein's theory of General Relativity tells us that a massive object bends space and time. As shown in Figure 2, the light traveling through this curved space-time bends to follow the curve, thus the massive object works as a cosmic lens. In the rare cases that a distant galaxy, an intervening galaxy producing a gravitational lens, and the Earth line up perfectly, the image forms a circle of light known as an Einstein ring. These gravitational lenses make the distant objects look much larger and brighter, helping astronomers to study galaxies, black holes, and dark matter in the distant Universe. SDP.81 is an excellent example of an Einstein ring. ALMA detected radio waves with a wavelength of one millimeter emitted by cold molecular gas and dust, the ingredients of stars and planets, with a resolution of 23 milliarcseconds, which surpasses the resolution of the Hubble Space Telescope. The image is so sharp that researchers found bends, branches, and small grainy structures inside the ring. To understand the causes of those fine structures, the research team produced a sophisticated model of the gravitational lens. This model is unique in its ability to precisely adjust for distortions in the lens, like correcting astigmatism. The model shows that the fine structures in the ring reflect the inner structure of SDP.81. Researchers found that several dust clouds with sizes of 200 - 500 light-years are distributed within an elliptic region 5000 light-years across (Figure 3). The dust clouds are thought to be giant molecular clouds, the birthplaces of stars and planets. The clouds in SDP.81 have sizes similar to those found in our Milky Way and nearby galaxies (Figure 4). This is the first time astronomers have been able to reveal the inner structure of such a distant galaxy. 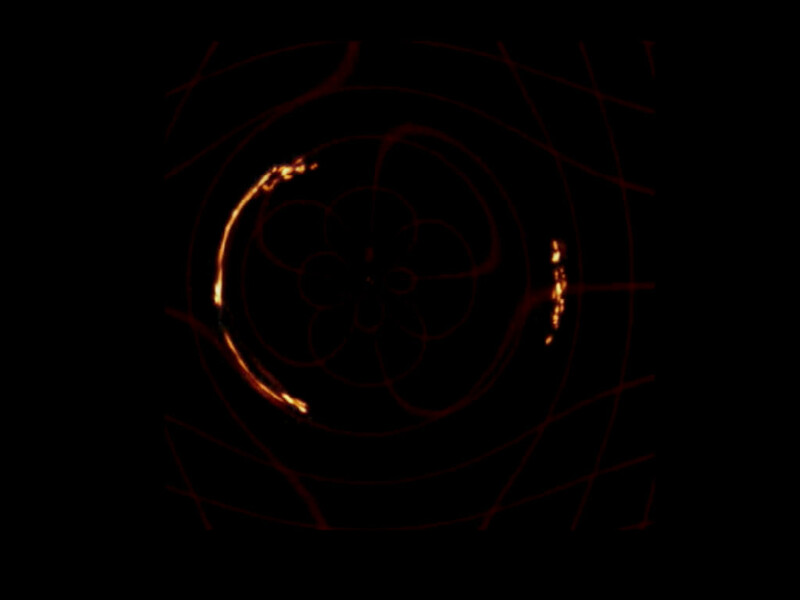 The high-resolution ALMA image also enables researchers to seek "the central image" of the background galaxy, which is predicted to appear at the center of the Einstein ring. If the foreground galaxy has a supermassive black hole at the center, the central image becomes much fainter (Figure 5). Thus the brightness of the central image reflects the mass of the black hole in the foreground galaxy. The central image of SDP.81 is very faint, leading the team to conclude that the foreground galaxy holds a giant black hole over 300 million times more massive than the Sun. 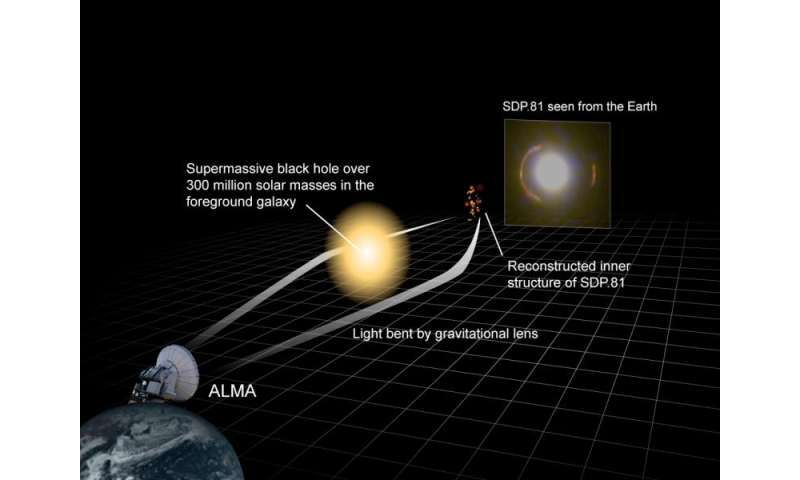 The gravitational lens acts as a natural telescope, enhancing ALMA's already unprecedented sensitivity and resolution. Using powerful telescopes, the team continues to unravel the mysteries surrounding the formation and evolution of monstrous starburst galaxies and supermassive black holes.